FINE! I know we’re not really experiencing a cold snap in NY, but the recent fluctuation in temperature has been significant to my desert blood. I need to satiate my dramatic urges by calling it all manner of things, and then comfort myself with a hot kitchen. Several years ago, I was fortunate enough to work in Chelsea, just a block away from the Highline. I never really figured out how to balance my schedule to allow more time for life and enjoyment, and so the latter tended to become an afterthought in the shape of quick meals here and there. One of the perks of my location was the ability to pop down the street to several restaurants, but I suppose that can be said of virtually any location in NYC and its environs. Of my many fabulous dining experiences, what remains deeply rooted in my recollections are particular bursts of tastes and textures, and, of course, the events around those moments. You could say I have many madeleines over which to nostalgia-sise. In all honesty, it is taking longer to get this down than I originally intended because I keep drifting (drooling) away. At Txikito NYC, it was the Foie Micuit, which caused to me to work out how one could subsist solely on foie gras. It’s not possible except in the wildest of dreams. At Bottino‘s take-out/sandwich joint, a colleague and I worked our way down the list of nineteen choices, and for me, the number two (prosciutto, marscapone, tomato, basil), number eleven (grilled eggplant, peppers, goat cheese, arugula, balsamic), and number seventeen (sweet coppa, peppers, asiago, arugula) were in regular rotation, along with a slice of chocolate bread pudding to share on special occasions. All of these were, and are, scrumptious, but Trestle On Tenth is where I found my comfort food. I never really got into the entrées because there were too many delightful choices to experience amongst the appetizers, cheeses, and charcuterie. My absolute favourite meal involved the beautifully-set rillette, pickled vegetables, whole-grain mustard, girolle-scraped rosettes of Tête de Moine, crusty bread, and the cream of cauliflower soup topped with herbed, buttery escargot, which gave me much-needed succour on many a late night. This is the meal and specifically the soup which has prompted this entire reminiscence. My world ended the night I was seated and discovered that it had been removed from the menu. In hindsight, I should have eaten gallons at each sitting, and perhaps dropped a spoonful into the scrapbook I will never keep. It’s not a very complex dish but it was MY dish to be consumed at the end of a rough day. Bereft doesn’t even begin to describe it. Somewhere along my version of the hopscotch steps of grief, came acceptance, and then anger. From anger sprang forth the determination to re-create what had been lost. The time since I last tasted the original is too great to create an exact replica, but that has never been my style anyway. When it comes to recipes, I colour anywhere but in the lines even when it’s one of my own creations. The first of the components, vital to this inspired work, is the cauliflower. I was all set to build a creamy white canvas when my seventh foodie sense urged me to turn around at the farmers’ market. The instant my eyes lit on the piles of purple and yellow produce, I knew I would be tossing out the script, in favour of a more colourful approach. I am rather fond of roasting the whole head of cauliflower with a little ghee and salt. Normally, once this step is complete, all self-restraint is tossed out the nearest window as I tear into the caramelised chunks and devour them while the pan is still too hot to touch. This time I persevered…sort of. That is to say, I factored in my past actions, and roasted more than one head. The 2-D brilliance of photography is that one can conceal the parts where one might have gnawed on one’s subject like a ravenous, deranged beast. Then there are the escargots without which this dish would be rather mundane, to my mind. For the uninitiated, escargot, is French for delicious but visibly unappetising snails. Nowadays, if you are unable to collect, feed, and prepare the snails yourself, there are several options available. For one, escargot are sold in cans, or so I have heard in stories. But, if something a little more unique is to your liking, you can (should) avail yourself of the offerings at Mikuni Wild Harvest. Guess which one I chose? Simmer them in some wine, slather them with herbs, butter, garlic, pop them in the oven, et voilà. I have no words left to describe the smell as this came out of the oven. In assembling the first plate, I always sprinkle on this and that, until I find the combination that makes my taste buds belt out an aria. Here, the finishing touches were comprised of Guérande grey sea salt, mace, grains of paradise, and white peppercorns. 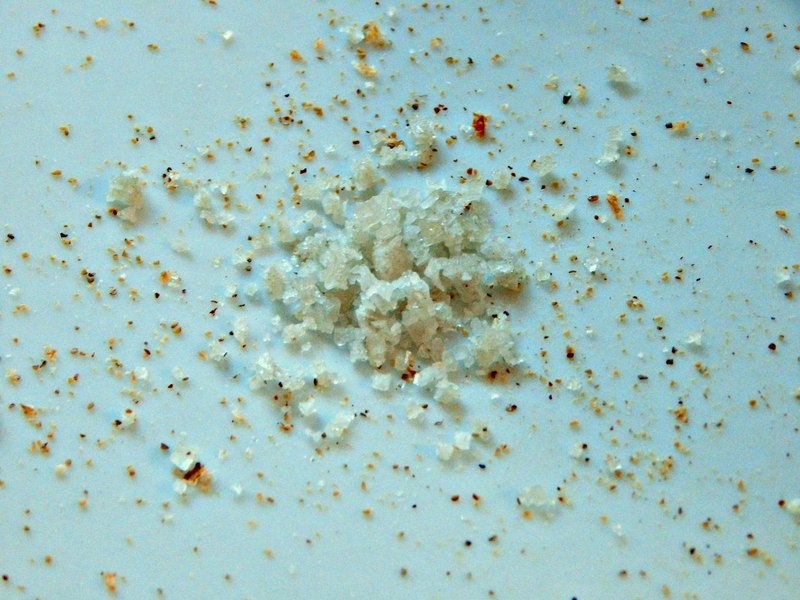 A small dish of olive oil, sprinkled with this spice blend, also made its way onto the table and seduced my toasted bread. A shamelessly delicious union, I must say. Some of the ingredients were chosen to further the colour scheme and you should adjust as needed or desired. See aforementioned note about colouring. Ghee can be substituted by butter or even oil, if you must. If you’re not a fan of escargot, you can replace with button mushrooms, omit entirely, use the herbed butter by itself, plain old chopped parsley, add a cheese such as Parmigiano Reggiano, so on and so forth. The possibilities are endless when working with the neutral base of the soup. Trim stem off cauliflower, cover whole head with ghee and sprinkle with salt. Roast until tender. In the interim, melt butter, add garlic, shallots, and cloves. When the onion is translucent, add the potatoes and carrots. Sautée for a few minutes. Add broth, bring to a boil, reduce heat, cover to simmer until vegetables are tender. 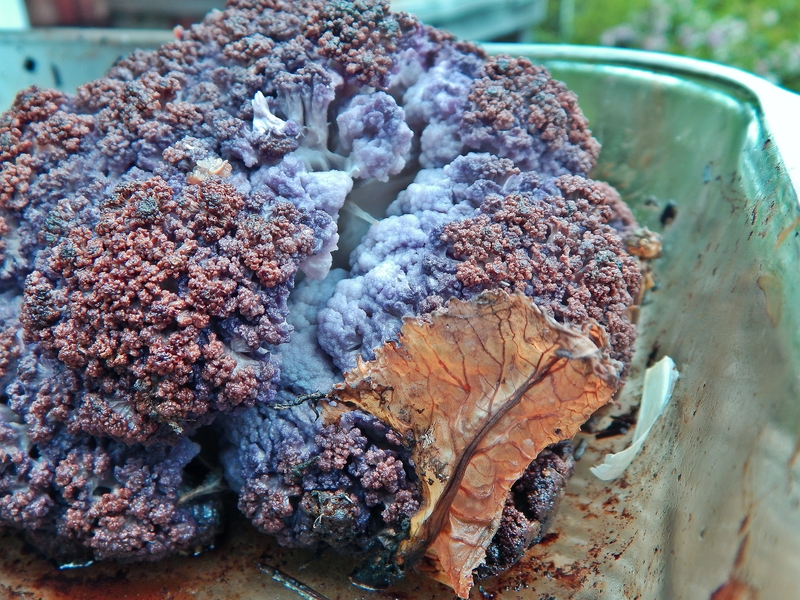 Puree soup with the cauliflower, or if you want a rustic look, roughly chop the cauliflower. Return everything to the pot. Add sherry, cream, and seasonings. Heat through and serve topped with the escargot, or as desired. 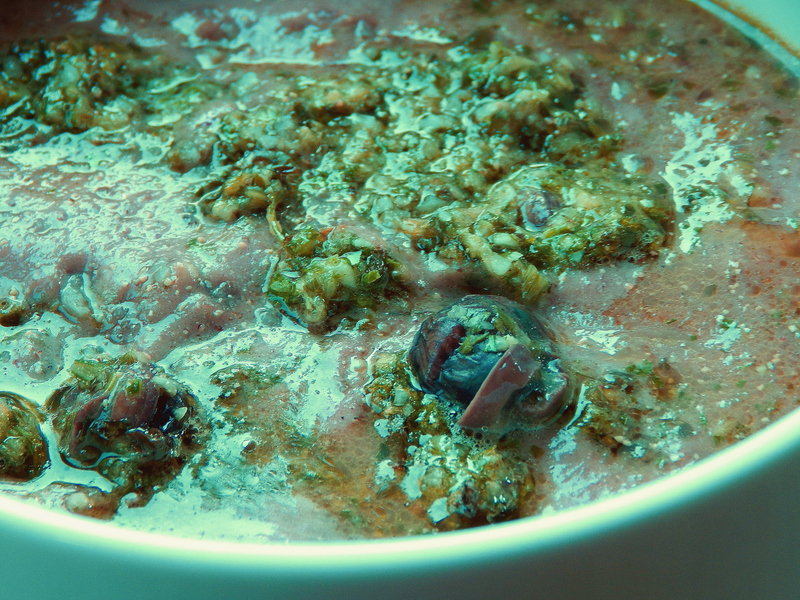 Combine all the ingredients in a food processor and blend, EXCEPT for the snails and bread. 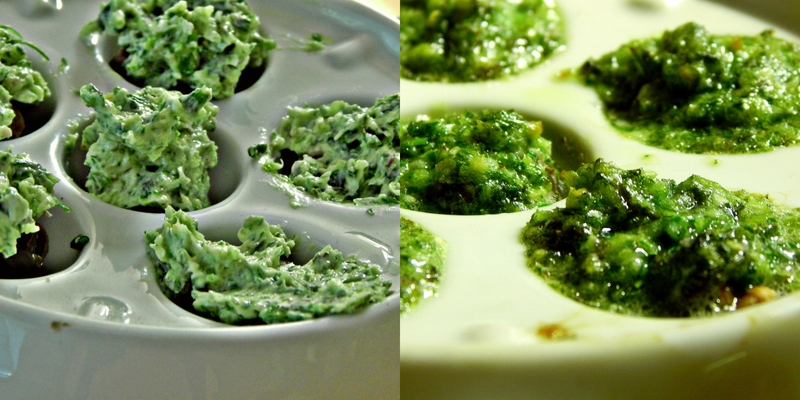 Place snails in their shells, in an escargot dish, and top with the herbed butter. Bake at 325° F/165° C for 25 minutes or until the escargots are tender. Spoon the escargots onto the already plated soup. Drizzle on the melted butter. Dip your face in it…I mean serve with warm bread, chilled wine, et bon appétit !